The article is based on the work of Susan Orsillo and Lizabeth Roemer who have written and lectured extensively on mindfulness- and acceptance-based CBT. Steven Hayes has pointed out that the first wave of CBT was Behavioral, the second wave was Cognitive, and the third wave is Acceptance. Third wave CBT includes Acceptance and Commitment Therapy, Mindfulness-Based Cognitive Therapy, and, to some extent, Dialectical Behavior Therapy. 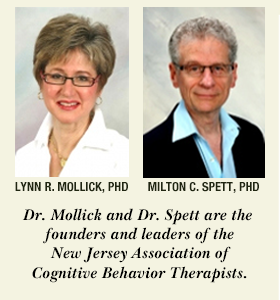 Third wave CBT rejects what Ellis calls "disputation" and Beck calls "cognitive restructuring." Anxious patients are often critical of their thoughts and emotions. As a result, they do not fully experience their emotions; they have only a vague or "muddy" understanding of their emotions, and they remain fearful and avoidant of these emotions. Anxiety patients try to suppress distressing thoughts and emotions, but the relief is temporary – the distressing thoughts and emotions return, often more powerfully. Anxious patients also avoid challenges, conflicts, and other situations that might evoke their distressing thoughts and emotions. Emotionally avoidant patients never learn to master distress-provoking situations, and miss out on many meaningful life experiences that they value. There are three components of Mindfulness- and Acceptance-Based Therapy (MABT): psychoeducation, mindful acceptance, and valued living. 1. Fear and anxiety are natural responses that help people deal with threat. But sometimes the ability to think and imagine causes humans to perceive threat where none exists and to avoid meaningful, rewarding experiences. 2. Emotion provides important information about oneself and others. Emotions prepare people for action. 3. Unclear emotion is confusing, intense, distressing, self-critical, and repetitive. Patients often enter treatment hoping to eliminate unclear, muddy emotions. 4. Unproductive strategies to control unwanted emotions include: resolving to do better next time; pushing away thoughts that might provoke unwanted emotions; thinking the opposite; seeking reassurance; trying to "understand" unwanted emotions; and distractions such as compulsive eating, drinking, drugs, TV watching, work, video games, and/or shopping. 5. Worry functions as avoidance because it reduces the unpleasant physiological components of anxiety. 6. Replacing emotional avoidance with mindful acceptance is a critical goal of MABT. MABT uses readings, discussion, metaphors, self-monitoring, and writing assignments to familiarize patients with how this model applies to them. Hand-outs, reproducible forms, and details of specific metaphors and when to use them are available in Roemer and Orsillo's Mindfulness- and Acceptance-Based Behavioral Therapies in Practice (Guilford Press, 2009). Mindfulness of Breath is usually the first exercise, although one can begin elsewhere if patients are very uncomfortable with bodily sensations. For example, panic patients are often very frightened of their physical sensations and might find Mindfulness of Sounds or Clouds in the Sky easier at first. These exercises develop the ability to focus on the present and teach being an uncritical observer of one's thoughts and emotions. Mindful Progressive Muscle Relaxation (MPMR). MPMR is an empirically supported mindfulness-based form of progressive muscle relaxation that is useful for anxious patients. However, patients should not do this form of mindfulness practice to relax. Instead patients should work on accepting their anxiety or any other thoughts and feelings that emerge during mindfulness practice. The MPMR exercise is available for free download at: mindfulwaythroughanxietybook.com/exercises/ along with other mindfulness exercises. These exercises are practiced during MABT sessions and are also assigned for home practice. Mindful Worry Monitoring. Begin with monitoring the situation and the worry. Add associated emotions, and efforts to control these emotions in each successive week. Other Mindfulness Exercises. Mindfulness of Physical Sensations is important because emotion has physical manifestations. Mindfulness of Emotions; Inviting in a Difficulty and Working It Through the Body; and Mindful Self-Compassion follow. These exercises ask patients to turn toward unpleasant emotions instead of turning away from them. Mindfulness helps anxiety patients accept unpleasant internal experiences, enabling these patients to be less constricted emotionally. More aware of their emotions, patients can make more rewarding life choices. General Mindfulness. Concurrent with formal mindfulness practice, informal practice takes place throughout every day, e.g. eating, washing dishes, brushing teeth, walking, cleaning. Patients should also work to bring mindfulness to difficult life experiences such as asking for a raise, having an argument with one's spouse, or giving a talk. Patients can record their formal and informal mindfulness experiences, but remind patients not to judge their mindfulness – no one can be mindful all the time. MABT helps patients live according to their values instead of according to their desire to avoid unpleasant emotions. For example, if a patient values friendship, that patient would work on being more open, generous, kind, rather than avoiding social interactions which might make them anxious. Writing assignments help patients articulate their values and set therapy goals. Begin by asking patients to write about how their anxiety interferes with valued living in four areas: relationships; work and education; self-nourishment; and community activities. (Warn patients that this exercise may be painful.) The next week, ask patients to describe in writing two ways they would like to be different in each of the domains where their anxiety has interfered. Patients should self-monitor opportunities to behave in valued ways and the obstacles to behaving in valued ways. Were patients mindful of their avoidance? Were patients mindful of their valued activities? Was the activity pleasurable or rewarding? The MABT concept of "willingness" refers to the commitment to take valued action in spite of unpleasant emotions. Operationally, willingness results in exposure. Note that unlike Cognitive Therapy, mindfulness- and acceptance-based therapy does not attempt to change dysfunctional cognitions. MABT encourages patients to engage in valued living in spite of their dysfunctional cognitions and emotions. MABT can be combined with other empirically supported treatments, e.g. 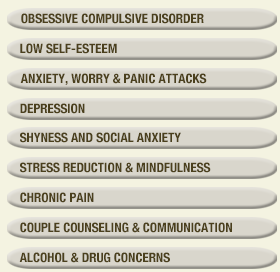 Exposure or Cognitive Therapy, to make these treatments acceptable to a wider range of patients.